I have a problem with most of the personalities on the Food Network. Now that is not to say that I do not watch the Food Network, because I do. A lot. I would be watching it right now now if I weren’t writing about it. I generally watch because I a) love food; and b) it’s better than most of the other TV options at 2:05P on a Tuesday in July. But there are some hosts on the channel I just can’t stand. I won’t name them, but if I hear “Yummo” one more time or have to look at either short, spikey blond-headed “Host Who Shall Not Be Named” again, I think I may quit my job, move to Guatemala, and hide in the folds of some squishy Guatemalan abuelita’s colorful, flowing skirts while receiving an IV drip containing Maya Ik. Oops. I’m already doing that! But there are several exceptions to my general annoyance with the Food Network, and leading the way is Ina Garten, front and center. She is like a cooking guru. Every time I watch her show I am not only struck by how approachable she is. She is as approachable as a person like that can be really – one who lives in the Hamptons year round cooking for her husband and a plethora of stellar foodie friends and her adorable little hobbit husband and, oh yeah, who shoots several TV shows and writes several books a year. But it’s not her clutch lifestyle that has me flipping the channel to the dreaded FN – it’s her food, one hundred percent. I can guarantee you the last ten times I have uttered, “Oh my god this is FABULOUS! Where did this recipe come from?”, the answer is either smittenkitchen.com or Ina Garten. My friend Chloe brought her potato salad to a 4th of July party a few years back and I would be shocked to hear that anyone else remembers eating it as I grabbed bowlful and fork, made myself a little sparkler barricade surrounding me and said bowl’o’taters so no one would disturb me and licked every delectable morsel away. I dream about that potato salad. But that is for another time. Today I want to talk turkey. No, it’s not Thanksgiving. Yes, I realize it’s too hot to turn on the oven. But you see, roasting a turkey breast is no big deal! It takes about one third the time of a whole turkey so you don’t have to keep your over on for long and because you’re cooking just the white meat, you can bake to perfection without overdoing it in order to cook the dark meat as well. I like to keep it around for a healthy snack or a quick turkey dinner or to toss in a salad. And it makes the BEST turkey sandwiches. 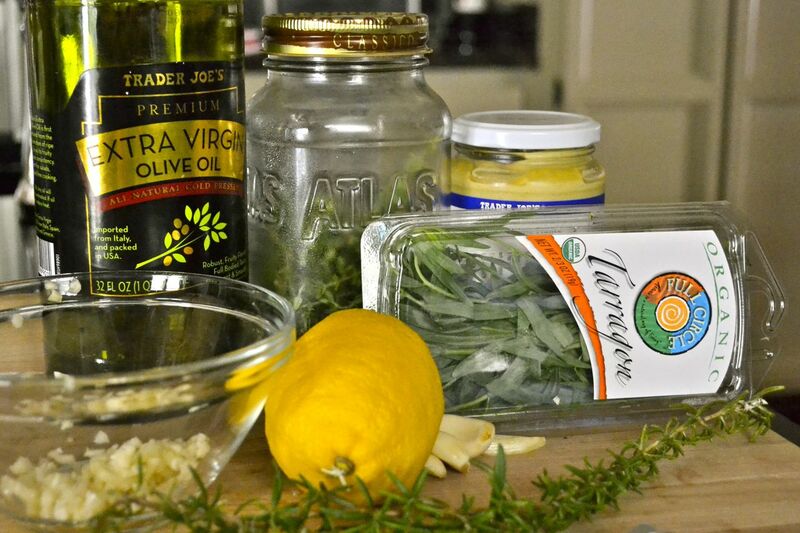 So turn your AC up and kick on your oven – it’s turkey time, Garten style. In the words of her great goddess, “How easy is that?”. Enjoy! Active time: 15 minutes, Inactive time: up to 1:30; serves 4 stand alone, or makes 8 sandwiches. Roast the turkey for 1 1/4 to 1 1/2 hours, until the skin is golden brown and an instant-read thermometer registers 165 degrees F when inserted into the thickest and meatiest areas of the breast. (I test in several places.) 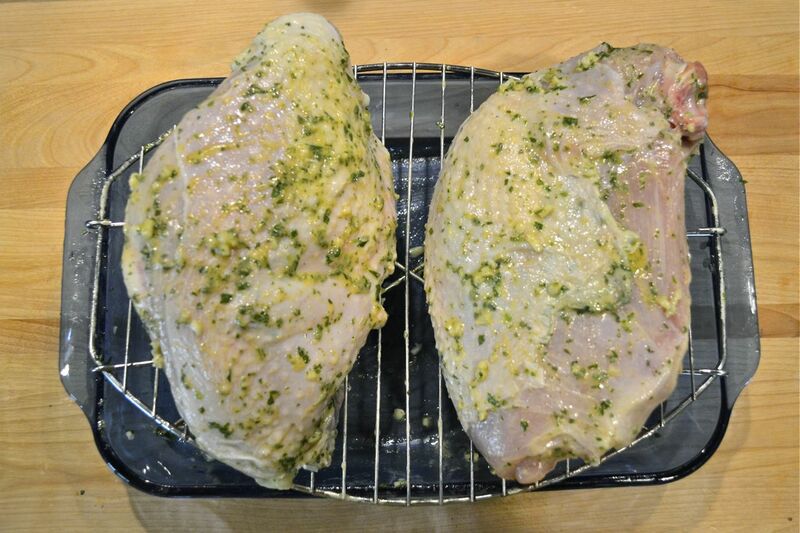 If the skin is over-browning, cover the breast loosely with aluminum foil. When the turkey is done, cover with foil and allow it to rest at room temperature for 15 minutes. Slice and serve. Toast bread slightly. 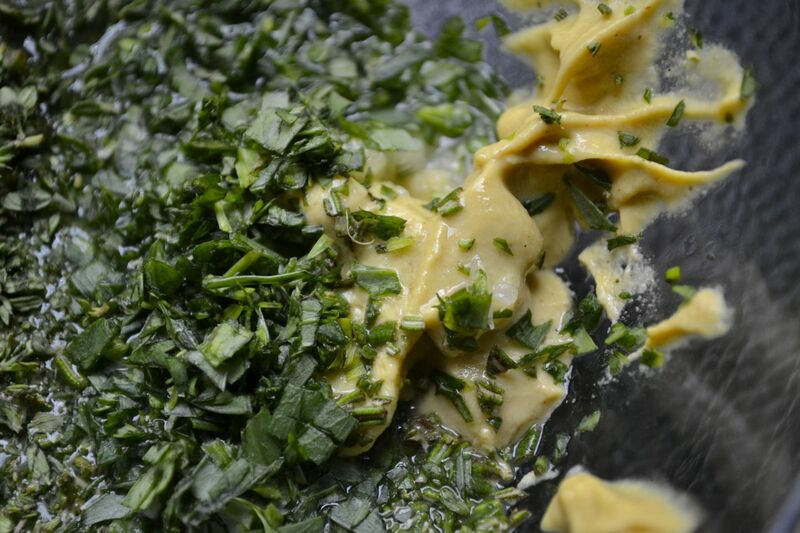 Mix mayo and pesto together; spread evenly on all 4 slices of bread. 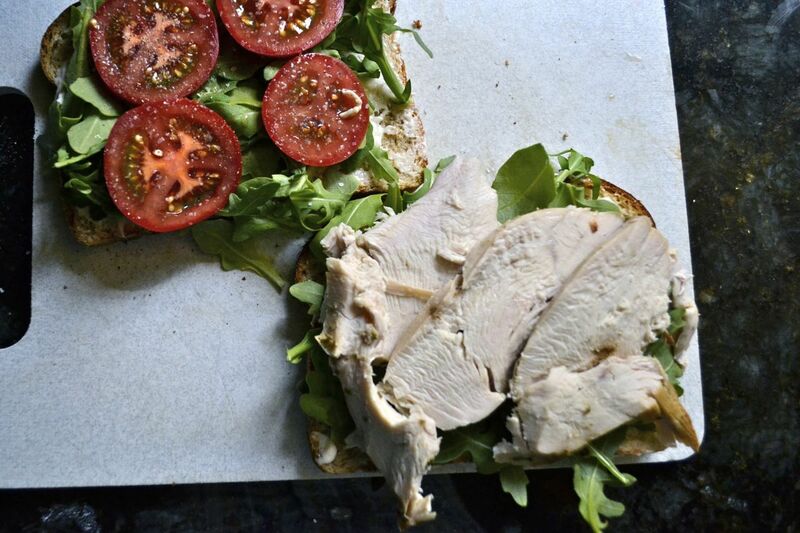 Layer arugula and tomatoes on 2 pieces of bread, turkey on the other two pieces; salt and pepper the tomato side lightly (about a pinch of salt and a pinch of pepper total). 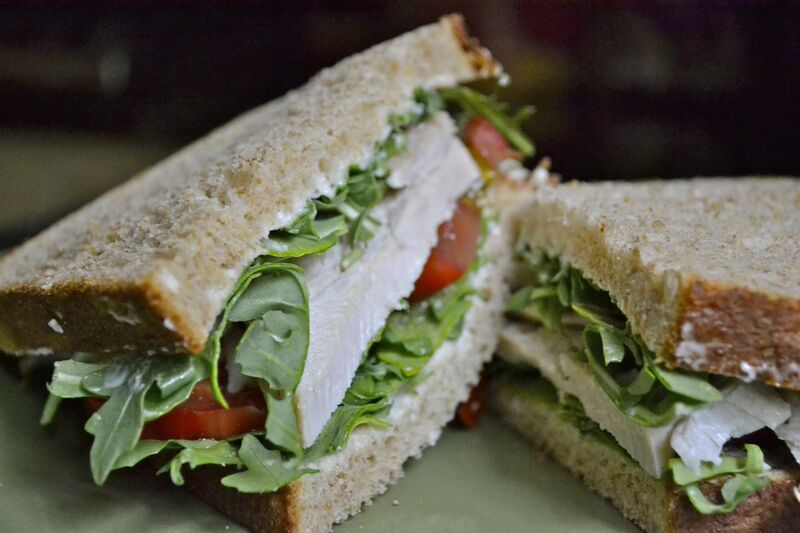 Flip turkey and bread onto tomato side, slice and enjoy! For extra fun, serve with potato chips smashed into the sandwich.